The temperature trend to date may be among the most remarkable on record for the period here. November 2010 is to become the ninth consecutive month to close with a temperature which has averaged warmer than normal. That's a nearly unprecedented accomplishment. It means meteorological spring (March through May), meteorological summer (June through August) and meteorological autumn (September through November) have each finished above normal. An in-house analysis of Chicago's seasonal temperatures indicates there have only been two instances since Midway Airport observations began in 1928--the years 1998 and 1999--in which spring, summer and autumn have ALL been above normal--including each of their constituent months! The report also mentions we've had the sunniest autumn in 11 years. Of course, it's almost December, which means relative warmth can still mean absolute misery. Alaska has sent us a storm which should arrive Saturday morning, bringing the first significant snowfall of the year. The Homeland Security Department said the colors would be replaced with a new system — recommendations are still under review — that should provide more clarity and guidance. The change was first reported by The Associated Press. I wonder what that guy at O'Hare—the one who says "The current threat advisory level is orange" all day—I wonder what he'll do now? My demo site, Weather Now, has a feature showing weather extremes for the world. Northwest Canada right now is having unusually cold weather. What's the connection? The Calgary Herald published a story about the website yesterday and syndicated it across Canada. Jenna McMurray of the Calgary Sun also picked up the story, and called me for a quick interview. As a result, Weather Now went from a daily average 4,000 page views up to a server-smashing 337,000 yesterday. It seems traffic has tapered off a bit today, but I'm still getting enormously more hits than usual. Get your facts straight. You and others in your country love to make statements based on minimum research and not double checking what you "think" is correct! Calgary: 2nd coldest place on earth is just as stupid a comment as other comments on your home page: the world (just the US)! Good grief, no wonder the rest of world laughs at you behind your back. It took me a few seconds to work out the "just the US" part, but apparently she referred to the link of "coldest places" that filters for just U.S.-based weather reports. The site is a programming demo, not a commercial website. As such we only get free information from U.S. government computers. We have no control over the quality or quantity of information that foreign governments make available to the U.S. National Oceanic and Atmospheric Administration, nor do we have any control over what NOAA makes available to us. The difficulty our site faces is that Environment Canada and similar agencies in other Commonweath nations retain Crown copyright over most of the data that we would want on our site. EC only makes data available for about 100 stations in Canada. So even though it got down to -35C in parts of Alberta Monday night, the only stations we had available in the affected region were two near Calgary, which only got to -30C. As it turns out, northern Alberta briefly got colder (-39C) than Antarctica (-38C), and was, as far as anyone knows, the coldest place on earth. The site automatically produces the lists of hottest and coldest places every 20 mintues without human intervention. All these facts conspire to produce some odd results from time to time, particularly during severe weather events such as the one Canada is experiencing in Alberta, Saskatchewan, and the Northwest Territories right now. As for the rest, I assure you the world laughs at us to our faces, not behind out backs. We have a reputation for being rude, thoughtless, and belligerent that other people--for example, Canadians--do not. It occasionally makes polite discourse difficult, as people sometimes assume the worst motivations on the basis of the most banal facts. She thanked me for my considered reply. Aww. Just a back-of-the-envelope estimate here, but I'd say that ad will pay for groceries for the next couple of years. With fewer than 21 days until the end of school forever (or at least until I get the loans paid off), I've spent all my non-work time thinking about entrepreneurship management, emerging market strategy, technology strategy, and environmental economics. Between them I have three papers and one pricing project to complete. The first paper is almost done, pending comments from one of my sources. I'd go celebrate but I have the other three assignments, you see. Someday, I'll look back upon this time, laugh nervously, and change the subject. But the public continues to struggle with questions about the Troubled Asset Relief Program known as TARP: Just 16% say, correctly, that more than half of the loans made to banks under TARP have been paid back; an identical percentage says that none has been paid back. 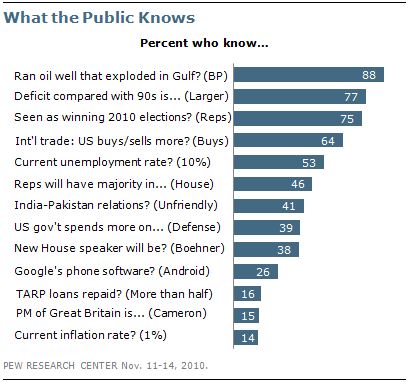 In Pew Research's previous knowledge survey in July, just 34% knew that the TARP was enacted under the Bush administration. Some of these misconceptions might have something to do with Republicans lying about them, of course. Substantial rivals for [Rahm] Emanuel['s mayoral candidacy] are surprisingly few. Jesse Jackson junior, a congressman, says he will not run. He has been criticised for ties to a blonde and to Rod Blagojevich, the disgraced ex-governor, thankfully in separate incidents. My reading list occupies two and a quarter shelves in my living room. No matter. I have another 60 or 70 years left, and I'm on airplanes a lot. I'll admit to a little twinge when I buy a Kindle edition of a print book I already own, but, hey, I'm supporting the arts. Will Panzo's "The Man Of Tomorrow Or Maybe You've Heard This One Before, But You've Never Heard It Like This"
Dying planet. A boy, a rocket, a last hope. Kansas cornfield crash landing. Ma finds it sleeping in the crater. Pa fetches the shotgun. J. Matthew Zoss' "Houston, We Have a Problem"
I'm sorry, but there's not enough air in here for everyone. I'll tell them you were a hero. I've also added Buzz: The Science and Lore of Alcohol by Stephen Braun and The Soul of a New Machine by Tracy Kidder. My strategy professor excerpted part of the latter for an assignment last week, and I got hooked. The tragedy really hooked me: the book chronicles Data General's push to develop a 32-bit minicomputer...in 1979, three years before IBM released the PC. A US Army staff sergeant, now serving in Afghanistan, writes about the new enhanced pat-down procedure from the TSA. Summary of his very powerful message: to avoid giving gross offense to the Afghan public, and to prevent the appearance of an uncontrolled security state, the US military forbids use on Afghan civilians of the very practices the TSA is now making routine for civilian travelers at US airports. Everything about security involves a balance. "Perfect" security would mean complete controls on freedom, elimination of privacy, etc. Someone who is now exposed to real, daily danger in Afghanistan because of decisions about the proper balance argues that we need to be braver society-wide. The soldier's note is worth reading.